John Fahey was an American fingerstyle guitarist and composer who pioneered the steel-string acoustic guitar as a solo instrument. His style has been greatly influential and has been described as the foundation of American Primitivism, a term borrowed from painting and referring mainly to the self-taught nature of the music and its minimalist style. Fahey borrowed from the folk and blues traditions in American roots music, having compiled many forgotten early recordings in these genres. He would later incorporate classical, Portuguese, Brazilian, and Indian music into his œuvre. His childhood was marked by fishing excursions on the nearby Susquehawa River and upper Chesapeake Bay and immersion into the worlds of classical and popular music. Both of his parents were accomplished piano players, and they often took their son to shows featuring leading country and hillbilly musical groups of the day. Fahey's early interest in country and bluegrass music led him to discard the clarinet (which he had played in the school band) and purchase a guitar with money he had saved from his paper route. In 1956, after a brief stint at the University of Maryland, Fahey transferred to American University in Washington, D.C., where he juggled his studies in philosophy with his rapidly growing interest in music composition. In 1957 Fahey heard a recording of "Praise God I Am Satisfied" by bluesman Blind Willie Johnson, a song that Fahey called the most beautiful thing he had ever heard. This proved to be an epiphanic event for the teenager, for he quickly turned his attention to the previously unexplored realm of blues. Fahey subsequently made several trips through southern states, combing through record bins and poor black neighborhoods in search of rare 78 recordings of blues and traditional country material. These journeys contributed to Fahey's understanding of blues and folk music, and his knowledge of these forms eventually became encyclopedic in breadth and scope. By the late 1950s Fahey was making pocket money at Martin's Esso Station, where he worked the night shift. "We pumped 100,000 gallons a month. Martin's was the only thing open in the county," Fahey remarked to Coley. "I became a very important person for the only time in my life. I still dream about it. I have very nice dreams of going back and working all night at this gas station." Encouraged by acquaintances who had heard him play, Fahey arranged to have his own record pressed at the facilities of a major record company. Blind Joe Death was the result. The record was the first release on the Takoma label, so named by Fahey as a salute to his hometown. While the label's birth was a modest one, Takoma gained renown over the years as the home of a unique and influential brand of guitar-based music. After receiving his B.A. in philosophy, Fahey moved to California to continue his studies. He studied at the University of California-Berkeley for a time, but freely admits that the social scene there left him cold. He subsequently moved on to the University of California at Los Angeles (UCLA) in 1964 to work on a Ph.D. in folklore and mythology. As part of his studies, Fahey wrote an empirical thesis on blues singer Charley Patton that was later published by Studio Vista Ltd. in London. The mid-1960s proved a rewarding and creative musical period for Fahey. He released several fine records on his Takoma label, including Death Chants, Breakdowns, & Military Waltzes and The Dance of Death & Other Plantation Favorites. At the same time, he and fellow blues enthusiast Ed Denson (who also became a partner in Takoma Records) rediscovered and revitalized the career of Booker (Bukka) White, a noted bluesman who had fallen into a life of poverty. "A couple of years later," noted Barry Hansen (better known by his radio moniker of "Dr. Demento") in the liner notes to Fahey's Return of the Repressed anthology, Fahey and fellow guitarists Henry Vestine and Bill Barth "found Skip James in a Mississippi hospital. At the time, only a few record fanatics remembered Skip's amazing 1932 recordings, but the tours and albums he made after his rediscovery cemented his place in the blues pantheon." Fahey was married at the turn of the decade, and by the early 1970s Fahey's recording and business fortunes were heading in different directions. His records were hailed as brilliant and trailblazing additions to the music world, and he established himself as a riveting, if unpredictable, figure on the concert circuit: "He would lumber onto the stage looking like a cross between a liquor-fueled bear and a slightly seedy college professor, then fill the air with a mix of fantastic guitar-playing, loud burps, and caustic asides," noted Coley. Long-time Fahey friend Hansen confirmed that the guitarist was fond of heckling his audiences. "In the days when political correctness didn't have a name yet, John could be counted on to be as politically incorrect as possible. One never quite knew whether he was speaking his mind or simply playing devil's advocate for the fun of it, to get a rise out of people." Fahey's Takoma label faltered, though, despite the company's release of the popular record Six- and Twelve-String Guitar by Leo Kottke, whose early work was influenced to a significant degree by Fahey. According to Spin contributor Coley, Fahey simply could not maintain his interest in the nuts and bolts of running the company: "His attention drifted too easily. His marriage broke up, he investigated countless Eastern and Western philosophies, spent time roaming through India, and devoted less and less energy to the business side of the label." He finally sold Takoma to Chrysalis in the mid-1970s. The loss of Takoma did nothing to blunt the favor that Fahey enjoyed with critics. Landmark releases such as Fare Forward Voyager, Of Rivers and Religion, John Fahey Visits Washington, D.C., and The New Possibility--records that featured a dizzying synthesis of country blues, folk, psychedelia, Indian, and classical influences--only added to the Fahey mystique. Record reviewer Dan Forte called John Fahey "the spiritual father, the hardbound edition, of the open tuning/steel-string school known as American Primitive Guitar--mentor to Leo Kottke and a legion of Kottke and Fahey clones." Coley concurred, writing in Spin that "Fahey has created a universe of complexity, emotion, and exquisite otherness for acoustic steel-string guitar. His musical inventions match those of John Coltrane and Harry Partch for sheer transcendental American power. As Fahey's acolyte Leo Kottke once said in an interview, 'John is one of the heroes of whatever this country has for a culture.'" After a divorce from his first wife, Fahey remarried. By 1981 he and his wife were living in Salem, Oregon. As the decade wore on, though, Fahey's physical condition deteriorated. Heavy drinking and a series of ailments (including diabetes and a debilitating five-year bout with Epstein-Barr syndrome) took their toll on his personal and professional life. He and his second wife divorced, and his musical output dwindled. "I could feel [the Epstein-Barr virus] when it entered me, and I could feel it when it left," Fahey told Coley. "That's when I was at my apex of drinking. I had to drink a lot of beer for the energy. I didn't play nearly as much. I talked most of the time. It was horrible." Fahey has yet to wholly recover from those dark days of the late 1980s and early 1990s. Fahey's economic circumstances in the mid-1990s were grim, and he continues to battle medical problems that severely curtail his touring ability. Still, there are indications that Fahey could see an upswing in his fortunes in the latter part of the 1990s. He is immersed in writing a book about the musicians he has met over the years, and is continuing his insatiable exploration of philosophical, religious, and musical theories and philosophies. In 1994 Rhino Records released Return of the Repressed: A John Fahey Anthology, a two-CD compilation of Fahey's work over the years. "He still plays splendidly," noted Hansen, "and with good fortune, the new millennium will be blessed with wondrous new Fahey soundtracks for its meditations, just as the past few decades have been." Fahey died February 22, 2001, in Salem, Oregon, after heart bypass surgery earlier in the week. He was 61. -Blind Joe Death, Takoma, 1959. -Volume 2: Death Chants, Breakdowns, & Military Waltzes, Takoma, 1963. -Volume 3: The Dance of Death & Other Plantation Favorites, Takoma, 1964. -Volume 4: The Great San Bernardino Birthday Party and Other Excursions, Takoma, 1966. -Volume 5: The Transfiguration of Blind Joe Death, Riverboat, 1965. -Volume 6: Days Have Gone By, Takoma, 1967. -The Voice of the Turtle, Takoma, 1968. -The New Possibility, Takoma, 1969. -The Yellow Princess, Vanguard, 1969, reissued, Vanguard, 1990. -Of Rivers and Religion, Reprise, 1972. -Fare Forward Voyagers, Takoma, 1973, reissued, Shanachie, 1992. -After the Ball, Reprise, 1973. -Leo Kottke/Peter Lang/John Fahey, Takoma, 1974. -Old Fashioned Love, Takoma, 1975. -John Fahey Visits Washington, D.C., Takoma, 1979. -Yes! Jesus Loves Me, Takoma, 1980. -Live in Tasmania, Takoma, 1981. -Railroads I, Takoma, 1983, reissue as Railroad, Shanachie, 1992. -Rain Forests, Oceans, and Other Themes, Varrick, 1985. -I Remember Blind Joe Death, Varrick, 1987. -God, Time and Causality, Shanachie, 1990. -Old Girlfriends and Other Horrible Memories, Varrick, 1992. -The Essential John Fahey (reissue) Vanguard, 1993. -The Return of the Repressed: The John Fahey Anthology, Rhino, 1994. -Popular Songs of Christmas & New Years, Varrick. -Christmas Guitar, Vol. 1, Varrick. 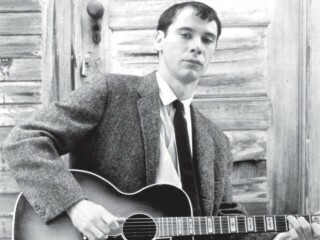 View the full website biography of John Fahey.